Cooking roasts has become something of a lost art. Intimidated by the sheer size and price of beef and pork roasts, modern cooks more often opt for smaller cuts. 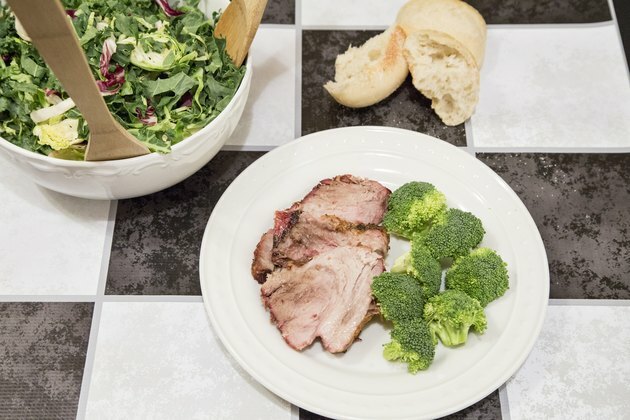 Yet a dish such as bone-in pork roast is a straightforward, no-fuss dish which rewards busy families with not only a roast fit for a formal Sunday dinner, but enough meat left over for sandwiches and casseroles later in the week. Modern cuts of pork roast are leaner than they once were, calling for shorter cooking times at lower temperatures to retain moistness. 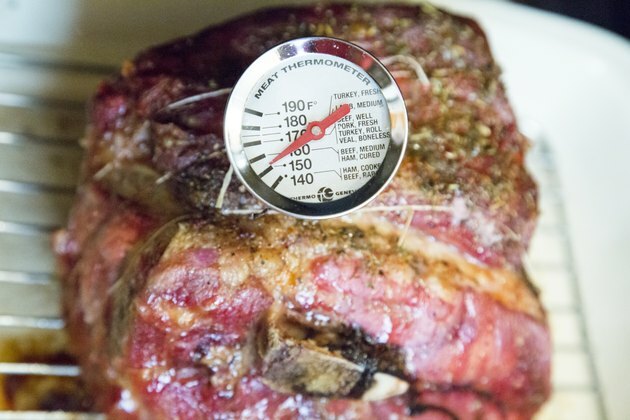 Invest in a meat thermometer to ensure the roast reaches a safe internal temperature. Brining the roast before roasting, while not crucial, adds extra flavor and tenderness. Brine the pork prior to roasting, if desired. Prepare your brining bag by lining a bucket or stockpot with the bag for extra sturdiness. Place the roast in the bag with water and brining seasonings, then tie or seal the bag closed and refrigerate for about six hours. 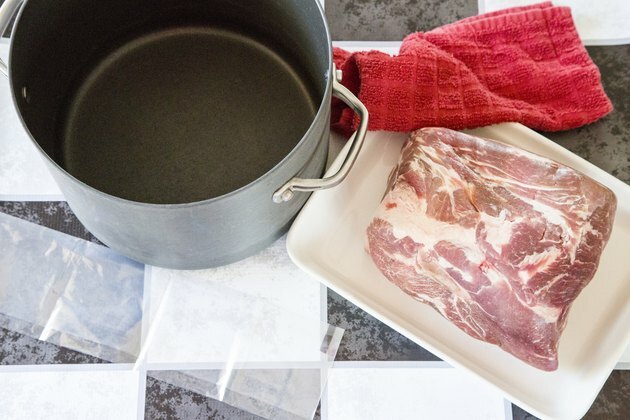 Remove the pork from its brining bag, and dry thoroughly. 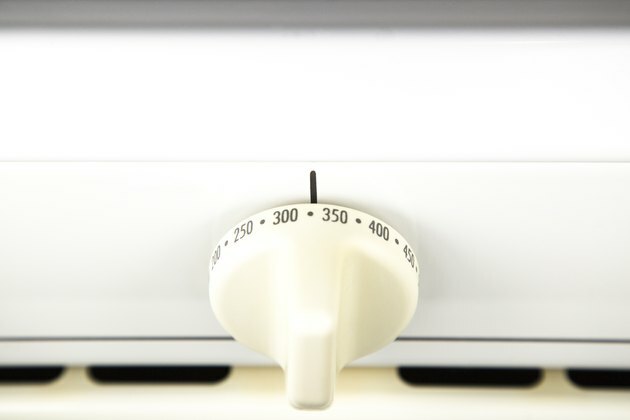 Leave it out to sit for 30 minutes to allow it to come to room temperature, and preheat the oven to 450 F.
Examine the roast to determine how much fat it has and where. 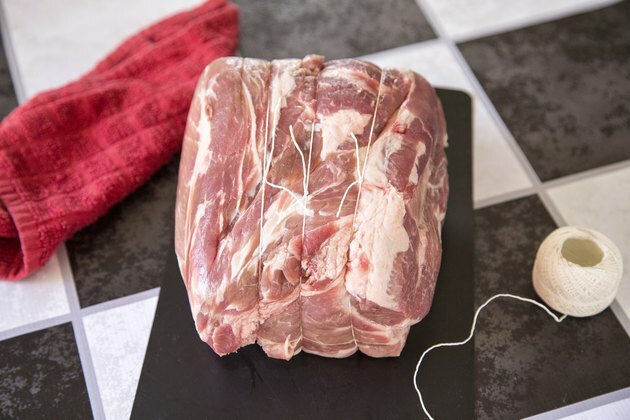 A naturally marbled pork roast needs to have excess surface fat removed; simply slide a knife under the fat layer and remove some or all of the fat. 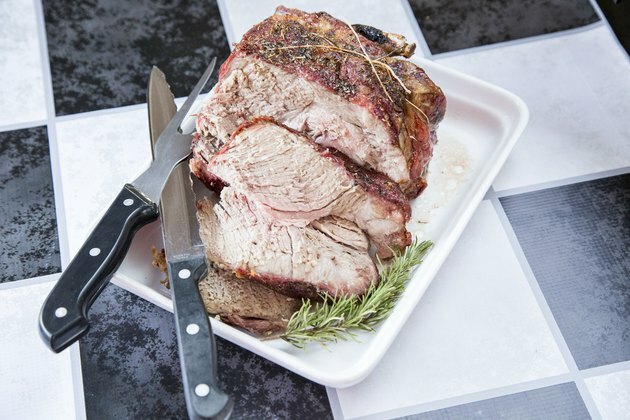 A roast without fat running through it needs to retain a 1/8-inch layer of surface fat and may require a coating of olive oil if it doesn't have enough surface fat. Wrap a series of string circles along the length of the roast, if desired. Slide lengths of kitchen string or twine under the roast, and tie them at the top. 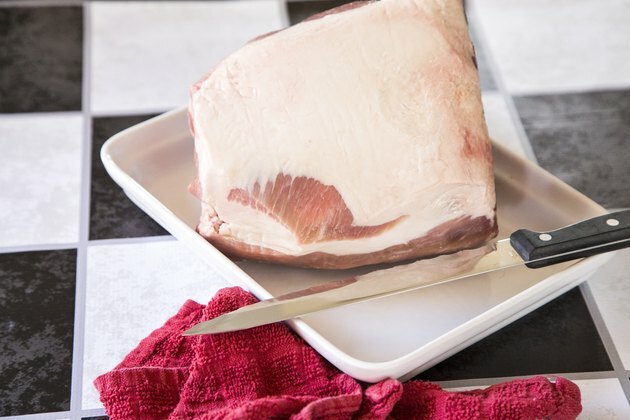 In general, boneless and crown rib roasts require this step more than bone-in pork roasts, but some cooks use it for bone-in roasts to maintain the pork's tidy shape. 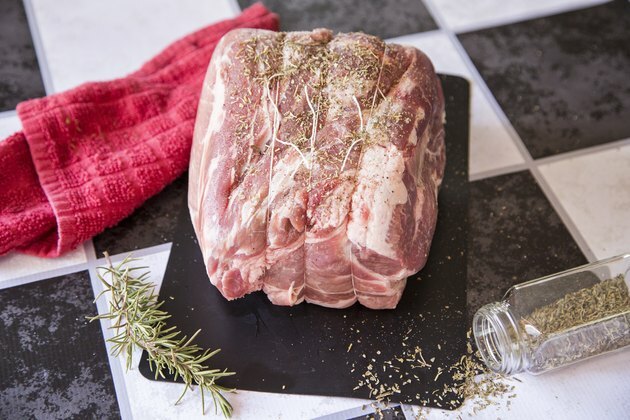 Rub the pork roast with your choice of dried seasonings. Salt and pepper are standard seasonings, and you may choose to add dried herbs such as rosemary or sage. Set the roast on a cooking rack inside a roasting pan. Sear the pork. While searing may be accomplished in a large pan on the stove, oven searing requires fewer pots. To sear the pork, put it in the 450-degree oven for 25 minutes. Lower heat to 325 F, and continue cooking the pork roast. According to the U.S. Department of Agriculture, you should figure on cooking bone-in pork roasts for 20 to 25 minutes per pound. A 5-pound roast, for example, will need between 100 and 125 minutes of total cooking time, which includes the searing time. Check the roast after it has been cooking at 325 for 75 to 100 minutes, depending on the size of the roast. Open the oven door, and pull the oven rack out partway to check the roast's internal temperature. 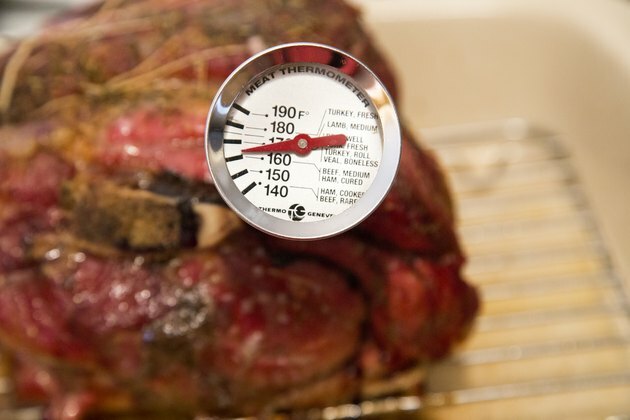 Place the cooking thermometer in the roast to determine if it has reached between 150 and 155 F. Piercing the roast with an oven fork to see if the juices run clear also verifies the meat has thoroughly cooked. Remove the roast from the oven once it reaches the optimal internal temperature. Let the roast stand for about 10 minutes, then check the internal temperature again to ensure a final internal temperature of 160 to 165 F.
Carve the roast, checking that the meat is white, rather than pink. If you observe that either the pork's natural juices or the meat itself has a pinkish tint, return it to the oven until the juices run clear. 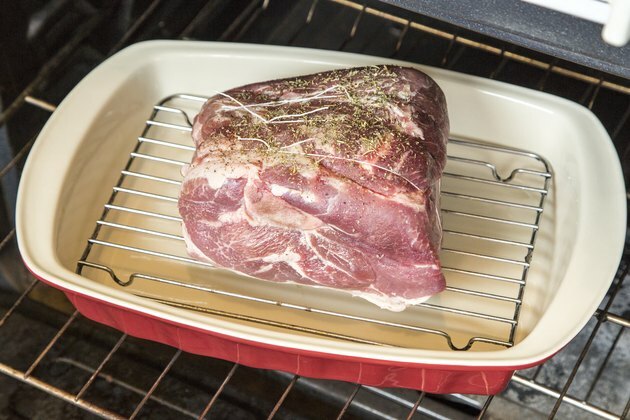 After removing the roast from the oven, lift the roasting rack away from the roasting pan to give you access to the accumulated drippings at the bottom of the roasting pan. Follow your favorite gravy and incorporates the drippings. 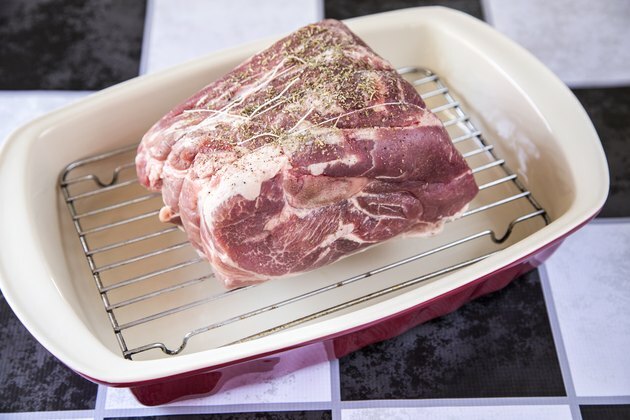 Apart from the searing stage, the pork will be more tender if roasted at a relatively low temperature such as 325 F. But if the oven temperature is lower than 200 F, you run the risk of consuming harmful bacteria. Do not prick the roast more than once or twice during the cooking process. Excess piercing of the skin with a knife or carving fork will drain the pork of some of its moist juices. Thermometers work best when placed directly into the meat rather than near a bone. Nearby bones will cause the thermometer to register a falsely high temperature. To avoid potential food contamination, do not carve or serve the cooked pork on the same surface you used to prepare it prior to cooking.